Performance of a play for radio, adapted from original documents, by playwright and historian Jonathan Ned Katz (1938-) and directed by Lois Adler. This is a documentary concerning the famous fugitive slave case that led Boston to riot in 1854. The voices are those of Niger Akoni, Susan Batson, Alan Becker, Gerald Fritz, Robert Lander, Margot Lewitin, Frank MacFee, David Margulies, Eric Nord, Douglass Ross, and Baird Searles. Produced for the 99.5 Radio Theatre by Jonathan Ned Katz and Baird Searles. Originally broadcast on WBAI on April 23, 1967. Technical notes: Voices are over-saturated throughout the recording. Around 38:45, a noisy recording plays, lots of pops/clicks, likely a dub of a disc. Folio linked to this record also features a related illustration on its cover page. 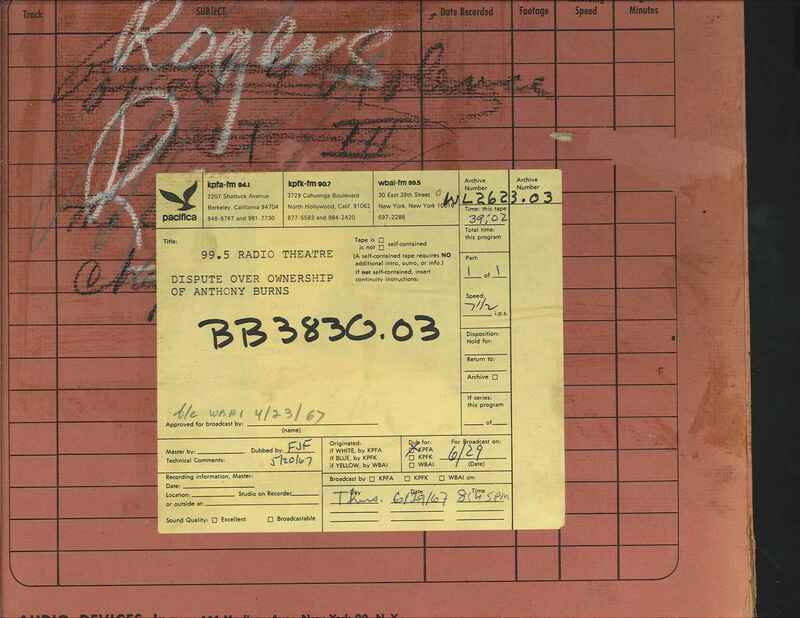 This recording was formerly cataloged as BB3830.03. 1 reel (40 min.) : 7 1/2 ips, mono.